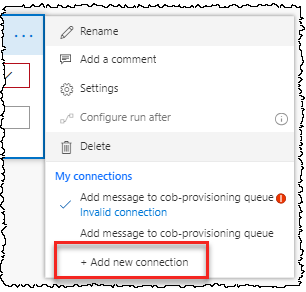 We have some pre-requisites to set up first – the Azure function app, queue and the SharePoint app registration. I recommend creating these first as you’ll need references from these things to put into later steps (your Flow needs details of the queue for example). To do this, navigate to the Azure portal, and then go into an appropriate Storage Account that you have. 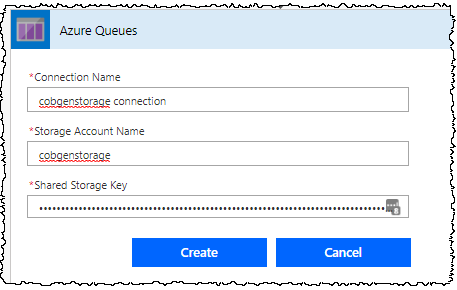 If you don’t have one already, just create one (it’s a container for Azure storage things such as queues, tables and BLOBs ). I won’t go into detail on this step as I’ve covered it elsewhere (e.g. 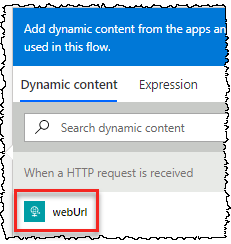 3 ways to create and debug Azure Functions) – but fundamentally we want to create the function app upfront to reserve the URL in Azure. We don’t have to do anything else at this stage. But it’s a good idea to do it early, as it would be annoying to specify the URL in one of the steps (e.g. registering the SharePoint app) only to find out that out someone else has taken it and you need to re-do lots of the config. Click the “Create” button when you’ve found the item. You’ll need to decide whether you’re creating a new Resource Group for this stuff, or whether it fits with one you already have. 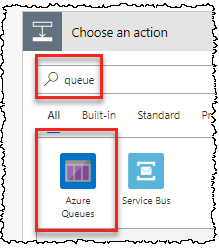 Again, this is just standard Azure app service stuff and there are lots of documentation and articles to help with these decisions if needed. Click “Create” when you’re ready. 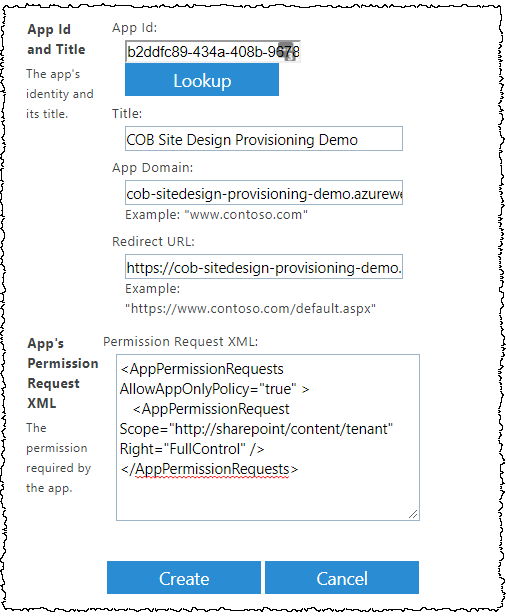 Ensure the function app gets created successfully, and make a note of the URL you used – you can get it back from listing the App Services you have in Azure if needed. Remember! Your Function App should use Azure Functions V1 for now! 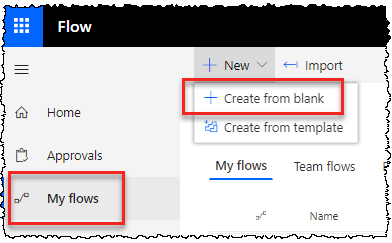 As of early 2019, you'll need to switch your Function App to use V1 of the functions runtime for now (due to .NET dependency issues with SharePoint CSOM and PnP). You'll need to do this before any actual functions exist in the app. To make the switch, go into the Function app settings and find the "Runtime version" setting. Change this to "v1" and save the config. To do this, we use SharePoint’s AppRegNew.aspx page to register our app. 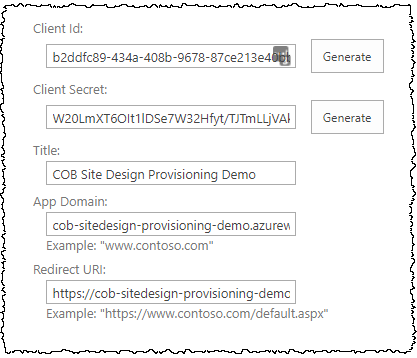 Remember this authentication approach results in a token that can only be used against SharePoint (as opposed to the Graph or other areas of Office 365), but that’s all we need when templating SharePoint sites – even if it happens to be a site which belongs to a Microsoft Team. Client ID and Client Secret can be new identifiers from the “Generate” button. The Title should be something you’ll recognise as belonging to this solution e.g. “Site Design Provisioning” or similar. The alternative to SharePoint add-in authentication is to use an AAD app registration and AAD auth. However, for app-only auth this approach is more involved as it requires you to create and upload a certificate (possibly self-signed) and select appropriate AAD scopes etc. If your code only needs to talk to SharePoint (e.g. to apply site templates) rather than talk to other Office 365 services via the Graph, then SharePoint add-in authentication is simpler. Just understand that you might need to use the other approach if you also want to configure the Microsoft Team or take some other actions. We’re now done with the prerequisites – so we’re ready for the Site Design, Flow and code for the Azure Function. Go back in to edit your Flow. Store the URL somewhere safe, ready for the next step. So that’s a site script. You’ll need to register both the site script and the site design using some PowerShell like the below. Success! Your site design and site script have now been registered, and it's hooked up to the Flow. However, we're not done yet - we still need our C# Azure Function which will actually do the work of applying the PnP template :) We'll do that in the next post..